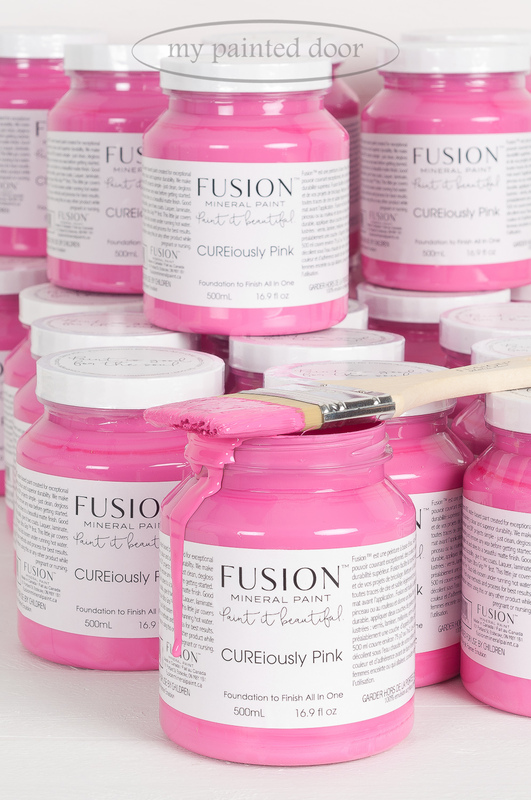 The newest Fusion Mineral Paint colour, CUREiously Pink has arrived! CUREiously Pink is a vibrant, limited edition colour developed in recognition of Breast Cancer Awareness Month. Never in a million years would I have imagined that taking photos of such a gorgeous colour could turn me into an emotional wreck, but it did. My paint order arrived yesterday and I decided to take a few photos. and I began to think about my Mom who had breast cancer when she was 44 years old. Today she is 85. Then I started thinking of two other wonderful ladies in my life who also had breast cancer and I added more bottles into my photo. My friend, Jan, was diagnosed with breast cancer earlier this year and I am extremely grateful that a recent visit to her oncologist confirmed she was cancer free. Another dear friend of mine was diagnosed about 15 years ago. Although I did not know her at that time, I can’t imagine not having her in my life. I am very honoured to call both ladies my friends. Then I started to think about all of our mothers, sisters, daughters and friends and I added more bottles to the stack. And then I got angry. Why so many ladies? A couple weeks ago I put aside a child’s chair that I was going to paint CUREiously Pink when my shipment arrived. But once I started taking photos, I knew this was not just another new colour. 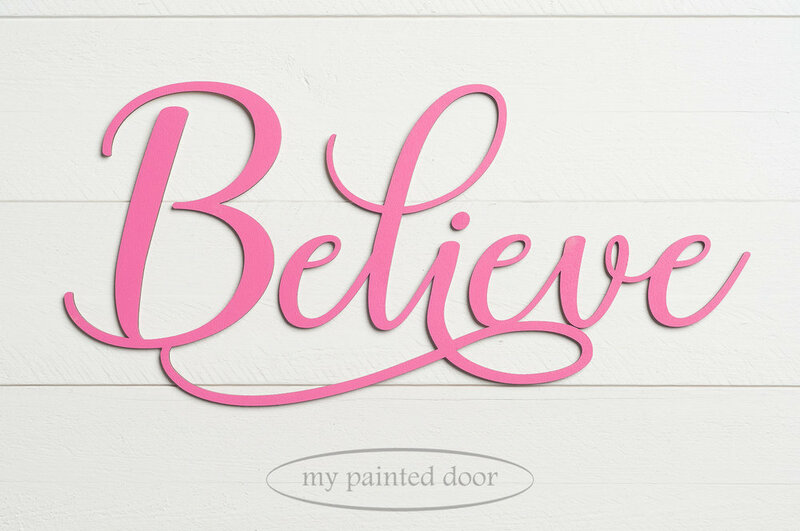 Sure, it would look great on a little chair, but instead I chose to paint the word Believe. Luckily I had a good nights rest before I wrote this blog post because last night I wanted to title my blog post “Screw You Cancer”. This morning I woke up in a better place. CUREiously Pink is a beautiful colour and pink is a symbol of breast cancer awareness and the fight to find a cure against the disease. I will be donating $3 to the Canadian Breast Cancer Foundation for each bottle that I sell in my shop or online. Fusion Mineral Paint is also donating $1 for each bottle sold. I know many of you love tester size bottles of Fusion Mineral Paint, but this limited edition colour is only available in the larger pint sizes. I also have the word Believe available for purchasing. It is approximately 13" wide by 6.25" tall and is laser cut from 1/8" thick baltic birch 3-ply plywood. I painted the planks in these photos with Fusion Mineral Paint in the colour Casement. Doesn’t it pair well with CUREiously Pink? P.S. I’d love for you to meet my Mom! I wrote a blog post about her earlier this year. She’s an amazing lady! 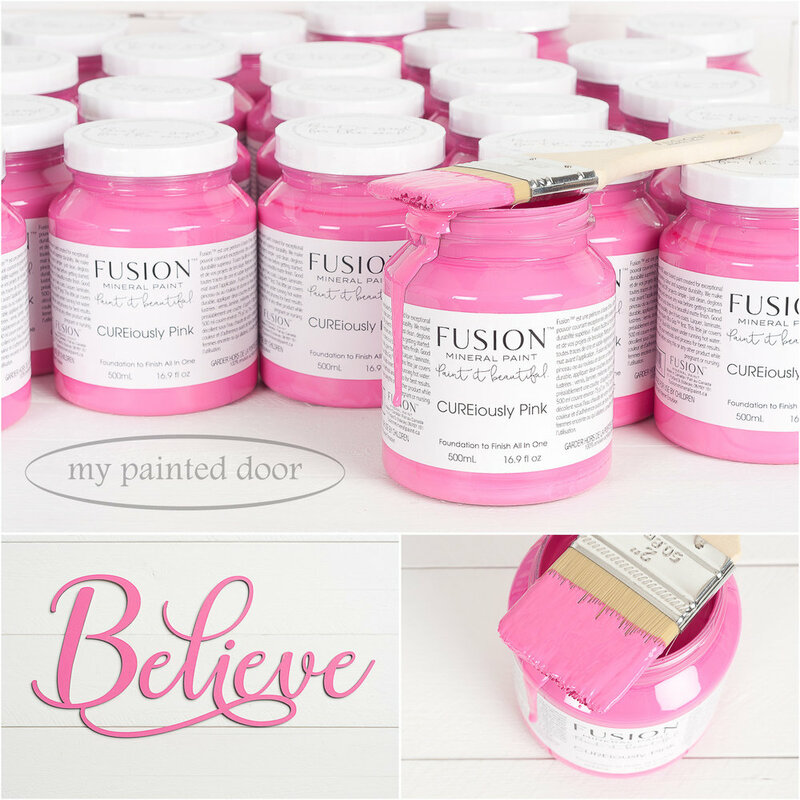 Posted on October 24, 2018 by Sue Sikorski and filed under Fusion Mineral Paint and tagged 2018 new colour cureiously pink.